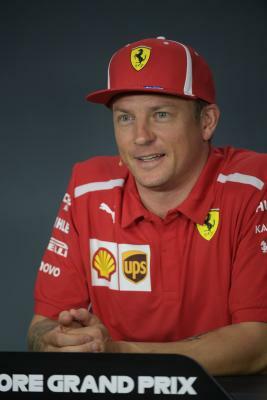 Singapore Sep 14 (IANS) Finland s Kimi Raikkonen (Ferrari) on Friday set the pace in the second free practice for the Formula One Singapore Grand Prix. Raikkonen set to leave the Italian team at the end of the year posted a time of one minute 38.699 seconds just 0.011s ahead of world defending champion Briton Lewis Hamilton (Mercedes) reports Efe. Red Bull s drivers the Netherlands Max Verstappen and Australia s Daniel Ricciardo came third and fourth respectively. Mercedes Finnish driver Valtteri Bottas completed the top-5 a little more than a half second behind Raikkonen (0.669s). A third free practice is scheduled for Saturday morning and then on Saturday afternoon the qualifying session for Sunday s race will be held.